goes into producing a conference such as the A.S.A. including our outstanding audio/visual team as well as a special thanks goes to Corinne Jenkins, the head of the Meetings Department of the A.S.A. ability to write in an engaging and accurate fashion about social science research. Among his many honors, he's received the first 2007 A.S.A. Award for Excellence in the Reporting of Social Issues. that in mind when you listen. But this is -- it's not an educational tape, it's a party tape. elected President of the United States, she will be the last female President that we will have for a very, very long time. That's the proposition. all kinds of questions and on a kind of course of further study that has resulted in this talk. craft and design on the other. And the idea was that women could handle craft and design, they couldn't handle fine art. going to be her focus. painting was selected by the Royal Academy. to paint about war in a way that is emotionally bracing and honest and no one had done that before. And when her painting is finished and received, it is greeted with an extraordinary enthusiasm. Piccadilly in London and it's a relatively small place. And there's a back room called the Lecture Room and if your painting is hung in the back room, the Lecture Room, it means they're not into it. hung on the line in Gallery 2. Mind blowing; this woman that barely anyone has heard of. touching the painting. This has only happened once before in the history of the Royal Academy. painting has touched the hearts of people in England as no other painting has ever done. at least in the way that people had imagined. female commercial airline pilots in the United States it is less than 7%. Right? Helen Richey did not signal a flood of women entering this profession. She entered and nobody followed. let in and the door closes after them, than when we see someone let in and the door stays open after them. to call the first troubling tokens and the second idealized tokens. operational. And what she says is if you're below that threshold you're a token. And if you're above it, you're not. both seen and not seen. And that makes it really, really difficult for you to function effectively. but they're perceived differently. That's an incredibly interesting insight. is a function of their representation in a group, not necessarily of their actual individual characteristics. rarely been equaled in contemporary Western politics. father must have died of shame. And surely thereafter in Parliament a member of Parliament stands up and repeats the phrase saying that her government should die of shame. response. She could not be considered simply as Julia Gillard, politician. She could only be considered in the public conversation as Julia Gillard, female politician and that's Kanter's point. suggesting is that she's a pioneer. That she took all of these slings and arrows for her gender in order that it would be easier for others to follow her. mistake in extending that kind of privilege. anti-Semitism was never about the blanket rejection of old Jews, it was all about the selective rejection of all Jews. exceptional status. And what is that? Well, Elon says that the king considers him an unJewish Jew. He makes a little separate category for him. all prejudice. The Germans hate Jews, but they love Berthold Auerbach. Auerbach. That opening the door to one outsider gave them license to hate everybody else. Freed them up to be absolute animals in the way they treated the others of that kind. more quickly than if they issued individual passports. the final solution in the last four years of the war. And they struggled to kind of bring these two halves of Eichmann's personality into some kind of balance. But I don't think you have to do that. colleagues in the Nazi party. Because look at me, I'm the guy who did all this work on behalf of Jews in the 1930's. the gas chambers and goes and sits in the library and reads extraordinary medieval texts in their original Hebrew. group as justification for closing the door to everybody else. paintings. They were acting in a way that was appalling to the majority. that if you're talented it doesn't matter who you are. And they realize, we've proven to the world we're not this closeted group of old men. beings are consistent. That once we accept one person of a kind that means we're going to accept everyone of that kind. We are invested in that notion. But that's the way we operate as human beings. such a pessimist about Hillary Clinton being a pioneer who opens the door to tons of other politicians? It hasn't happened anywhere else. and how beautiful she was. away with it. Because they've proven in the way they hung "Roll Call" but they're not prejudice, right? We're just making an objective judgment of this particular painting. related to art or otherwise. Here we are. Here's the first. not going to be reelected. But he was. >> And so much has been said about the fact that he had this big technology machine, I guess, I just wanted to comment on that. What might be intervening factors? Yeah. her. It's just that I won't accept another woman perhaps. But it's a good question. still women. And so I think it's a really interesting lecture. Thank you very much for it. There was so much else that was interesting along the way, but I don't think the thesis is likely to hold. different and it's certainly a way more puzzling that you see these patterns in elections than you see them in private, but it may just be a matter of time. exceptional. Thompson was unique and exceptional. Hillary Clinton is not. There are other Hillary Clintons behind her. And I think that's a very different kind of phenomenon than you are describing. So I believe you're wrong for reasons like that -- for structural reasons. You can forgive him for not understanding structural reasons because you're not a sociologist and I forgive you for that. 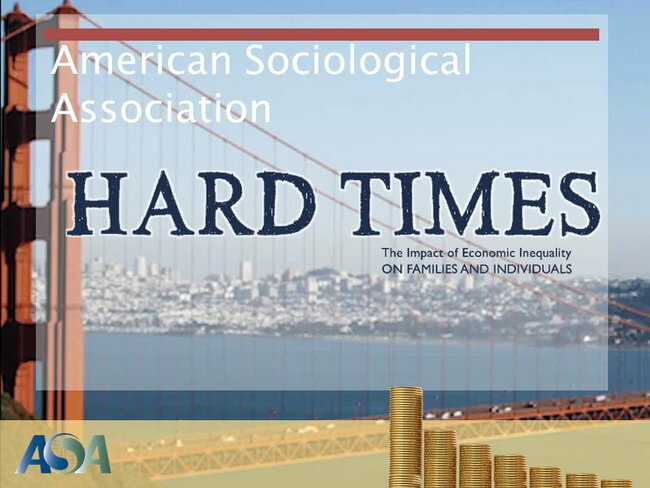 >> Thank you for showing us what it means to be public sociologist in hard times. [APPLAUSE] Can you offer some interpretation of that painful last word in Thompson's sentence "and wisely?" President has ever been. Why? Because she had political ambitions. That's the only reason, right? Betty Ford didn't have her financial dealings written about at exhaustive length in New York Time. interaction between those categories. You can start layering in these things and the difficulties and constraints deepen. level of umpf into it the second time around. So it's just a postulation. what the answer is. It's really interesting though. country are not as a result of your qualifications, but are as a result of who you know and especially if they have power. compelling my arguments are. Here, over here. disagree with your thesis are white males who likely have never experienced tokenism before. [APPLAUSE] And what that means for the obdurateness of this phenomena. whole story, but there's a huge part of the story. That there's something radically subjective about the way we see the world and we forget that fact at our peril, right. So, I'm with you. Absolutely. [APPLAUSE] All right, you're second last. she had authority, but other women shouldn't. >> So where would you say pioneers and tokens fall into your ideas about outliers? Are they both considered to be examples of outliers? Just tokens? Just pioneers? extent to which things I write today contradict things that I wrote yesterday. success for other groups can boomerang and end up hurting those who follow. That's like it's a deeply counter intuitive notion. That's why I think this idea of tokenism is so kind of insidious.